ARCHIVED MS and HSMS NEWS Archived News Bulletins and information of special interest to HSMS and MS operators The information you're hunting isn't here, either? Then try the Really Old News Page. EME conditions have been very good recently with some medium-size stations working some very small stations. HAARP is interested in receiving signal reports from radio amateurs who were able to detect, or not detect, the lunar echo or the transmitted skywave pulse from HAARP. It will be helpful if your report includes your call sign and the type and location of your receiving equipment and antennas. Reports may be sent to the following address: [email protected] If you made an audio or other recording, these are especially valuable for them. * The HAARP antenna array consists of 180 antennas on a total land area of about 35 acres. The array, along with its integrated transmitters, has a total radiated power capability of about 3,600 kilowatts. Aurigid Meteors on September 1? YES! The Aurigids showed up right on schedule in 2007! Bursts started increasing in number and duration just before 1100 Z. By about 1150 Z things were back to normal. But during about a 30-45 minute period, 144 MHz was filled with MS signals. It was reported that 50 MHz had "full time 6m ionization", and contacts on 222 were attmpted (results unknown). The earth passed thru the one-revolution rubble trail from long-period Comet Kiess at that time, as several forecasters had predicted. Comet Kiess has a period of approximately 2000 years, and extra meteors have been reported 3 times in recent years. At the peak time, about 1120 UTC, 144.200 was a solid mass of signals. It reminded some of the big Perseids and Leonids storms of a few years ago! Because the peak occurred after daylight and with a nearly full moon still in the sky in the eastern and central parts of North America, visual reports will have to come from the West Coast. At this time the ZHR is not known. But listening to 144 MHz during the peak, it seemed to approach minor storm proportions! Of course, the results given by visual observers often differ considerably from radio reports. The only reports seen at this time (Saturday morning) are real-time PJ radio reports. These were all extremely good. So whether or not the outburst reached storm levels, it provided a lot of contacts and excitement on VHF. BIG 144 MHz North American Sporadic E opening! On 2007 July 29, North America experienced one of the largest 2-meter Es openings in recent years. Around 1535 Z, K0GU (DN70) reported the first 144 MHz Es signal. Little more was reported until about 1700 Z when 2 meters opened across the Gulf of Mexico from Florida to Texas. The Es cloud then appeared to drift to the ENE, giving stations in other parts of the country the opportunity to get in on the fun. But then about 1930 Z the drift appeared to change direction, moving to the WNW, allowing still other stations to participate. By 2230 Z is was about over. Few details are available yet (watch a future issue of QST for a report with maps, etc - you have sent in a report, haven't you?). But as many as 200 stations may have been able to experience it! While this would be considered only a small opening for Europe, it is one of the best North America has had in several years. See the November 2007 QST, pp. 85-86, for more. North America had one BIG Es opening and 4 or 5 small to tiny openings in 2007. Even tho this year's Es season is now over, if you haven't signed up yet for PE1NWL's Es Alerting system, you definitely should do so. The automatic alerts during the few openings brought many more stations on the air that otherwise would have missed them. Read the details, get sign-up info on the ESAlerts page. (It is also very interesting to sign up for the European alerts, to see how many more they get than we have in North America). See the North Amercan log at http://www.gooddx.net/eskipNA.htm. North Americans - Remember to ALWAYS use Es in your messages on the 144 Prop page (at http://dxworld.com/144prop.html) when you are reporting sporadic E signals, in order to activate the DX Robot. But do not use it for any other reason, as it may trigger a false alert. Using "Es" in all notes concerning Es reception will also insure that your note is included in the North American Es Log summary for that day (found at http://www.xs4all.nl/~amunters/eskipNA.htm). Do not use Es (or es or E skip, or similar) when you are just making comments or asking questions on the "144 Prop page", for these will trigger false alerts! "Sporadic E - A Mystery Solved?" This is the title of a paper by Dr. David Whitehead, in two parts. It is available on line at the ARRL Web site, but in the members only section (you must be a member of ARRL, and have signed up to use this section). ZL3NE/1 has an article in the Winter 2006 CQ VHF that tells how to predict sporadic E with 95-100% accuracy. It appears to be simple enough. Do you understand it? Please let us know if it works for you! If you do not subscribe to CQ VHF, much of the article can be read at http://72.14.203.104/search?q=cache:5vrsE_8fTe8J:www.df5ai.net/ArticlesDL/ExternalRes/ZL3NEPropPredict.pdf+bob+gyde,+zl3ne&hl=en&gl=us&ct=clnk&cd=2. More Es information can be found at http://www.vhfdx.de/sporadic_e.html. Listen to live meteor pings on line! Go to http://www.spaceweather.com/glossary/nasameteorradar.html. (Note - at last report, only the first receiver was operational). I2PHD has released version 1.25 of Winrad to his Web site http://www.weaksignals.com and to the mirror site http://www.winrad.org. The N1BUG Web pages are back on line. Go to http://www.g1ogy.com/www.n1bug.net/ (The trailing slash is mandatory). Meteor scatter beyond 2900 km/1800 miles! Because of ducting, some VK and ZL operators have received meteor pings at extreme distances. Read VK7MO's report at Meteor Scatter and Tropo-scatter Extensions of Tropo-Ducting. Thunderstorm effects on 144 MHz sporadic E - Do thunderstorms cause or contribute to sporadic E? Many Amateurs have believed they did, but there has been little or no correlation found. In an effort to show that there is no correlation, several Europeans launched an intensive study of the topic. Their conclusion? "The first surprise results from the fact, that thunderstorm effects on 144 MHz sporadic E propagation cannot be generally excluded, in our view." No, their paper does not show that there is a correlation; but it also indicates that it cannot be ruled out! Read other surprises and a summary at http://www.df5ai.net/Material/articles.html#PaperThunderstromEffects, then take the time to read the whole paper. And be sure to check out the many other VHF offerings on DK5YA's great VHF Web site at http://www.vhfdx.de/. North American Es - the season seems to be over. Sunday, June 18, provided some Amateurs with a unique Father's Day present - a one-hour Es opening from the New England States to Florida. WA4OFS writes, "Very fine opening from Fla.to the Northest U.S on 2 meters this morning,Western PA to New England had S nine plus signals from many stations into central Fla."
Some stations reported 60 or more contacts during that period. On July 14, 2 meters opened from New England to the Chicago area and south to the Ohio River. N1BUG reports working many stations. July 15-16 brought yet another opening from New England to the same approximate area. Again, N1BUG seems to have anchored that end of the opening. Previously, there had been 4 or 5 small openings, all very small and brief, with only a few stations able to take advantage of them. There have been several more small openings, but nothing like the Europeans are getting. Since then, though, reports of any possible Es have dropped to about zero! Thanks to the several methods for being alerted to 144 MHz Es (see below), more fellows have been watching this year. Remember, if you are observing some interesting propagation, be sure to report it in real time! Otherwise the band may remain "dead" because of the lack of activity when it's actually open! Europe had primarily a number of small openings, but recently has had a number of openings that would be considered huge in North America. Check some of the Web pages below to keep up with their fun. This is Es Season! Are you monitoring? If you haven't signed up yet for PE1NWL's Es Alerting system, you can still do so. North Americans - Remember to ALWAYS use Es in your messages on the 144 Prop page (at http://dxworld.com/144prop.html) when you are reporting sporadic E signals, in order to activate the DX Robot. If you didn't try G7RAU's newer Beta version of his "Live MUF" program, it is available on his Web page in addition to his regular release (V6). These programs will also work for North American stations, so check it out at http://g7rau.demon.co.uk/soft/livemuf.asp. ACARS messages for detecting Es openings? Has anyone tried using ACARS 131 Mhz packets (AM), sent at 2400 baud MSK, for detecting openings on 144 MHz? 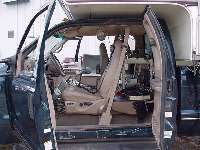 Many of these transmissions contain the position of the aircraft directly from the aircraft GPS. KY1K ( ) would like to know if you have experimented with this. If you are not familiar with this service, a Google search for ACARS will give you a number of Web sites that will give you the necessary background, and there is at least one freeware sound card decoder program available there, along with other things. A poor 14 MHz Es season in North America in 2005. The first known 144 MHz Es opening occurred very early this year, on May 21. The second was on the evening of May 30/June 1 after a week with the MUF flirting with 2 meters. Following that time, there were a number of small 144 MHz Es openings (June 4, 11, 12, 15, 18, and 22. They were all small, with spotty coverage. However, since the June 21-22 opening, there have been very few reports of the MUF approaching 144 MHz. In fact, even 50 MHz has been dead most of the time! The only other known openings were on the evenings of July 31-August 01 and August 02-03 and again were very small. (For summary of 2004 North American Es with the fantastic July opening, go to the Archive page). Sporadic E on 144 MHz in Europe was good early in the season, but then tapered off. There were a number of openings, some of them huge! It seems to have started somewhat early this year, then daily openings soon became standard! However, by European standards, it does not seem to have been an exceptional season. or see a map of the action (and comments) by going to http://www.vhfdx.de and clicking on the date in question on the right side of the screen. There were many Es openings in Europe in 2004, though not as many as they had in 2003. Europe's sporadic E season produced opening after opening in 2003. See an overview of the FANTASTIC 2003 European Es season at http://www.vhfdx.de/es_summary_03_overview.htm. WINRAD program (new version) available Alberto, I2PHD, has written a Linrad-type program that will run under Windows (W98SE and above), with not all, but with the fundamental functions of Linrad. Logically it is named Winrad. Be sure to read the User Guide before using it, and give him feedback, both positive and negative. This is just a first release. Others will follow, possibly with new functions, if there is enough interest. It looks very interesting - check it out. Winrad can be found at http://www.weaksignals.com. Note that there is a new version of it available now. (If you are not familiar with Alberto's other programs, be sure to look at them, too). TV EME - Rex, VK7MO, writes: The Australian TV station at Newcastle (near Sydney) is a useful beacon that can be seen by 144 MHz EME stations on a frequency of 138.276025 MHz with allowance for Doppler. Its grid locator is QF57sc, it runs 100 kw ERP. With four yagis and elevation it is typically visible on a waterfall program at 0.2 Hz resolution until the moon reaches 8 degrees at the TV station site. Jeremy, W7EME, adds: This is fun and I have been watching all sorts of things over the last ten years or so. The little Icom multi band rx or other brands and a simple vhf through shf LPA low gain broadband antenna is all that is needed. There are literally thousands of signals to be seen from 70 megs and up. It has been a great learning experience watching the moon sweep across a continent and watch the paging systems come and go. The large TV syncs as you stated are still alive, especially for me, Chicago and NY UHF stations which are megawatt erp at the horizon can actually relinquish viewable video off the moon sometimes! A good TV antenna is all that is needed with your rx and video decoder. If you operate 222 MHz, you might be interested to know about the NAVSPASUR 216.980 MHz beacon system from north-central Texas (also on 216.970 from Arizona & 216.990 from Alabama) that is pumping out megawatts of ERP. Even if you don't have equipment on this frequency, you will find information on NAVSPASUR interesting. See http://www.k4gfg.us/navspasur/index.html. Rob, PE1ITR, reports: Last month I did some moonreflection receiving experiments with the NAVSPASUR radar on 216,980 Mhz. Reflections where very strong. See my website: http://www.itr-datanet.com/~pe1itr/navspasur.html. See real-time graphs when available at http://www.itr-datanet.com/~pe1itr/live/live.html. Do you like auroras? Would you like more? SpaceWeather.com has collected every aurora photo ever published on SpaceWeather.com into one "mega-gallery." There are spooky auroras, man-made auroras, auroras in Florida, auroras at the South Pole, auroras beneath the space shuttle--thousands of photos. Together, they are a unique chronicle of space weather since the year 2000. Browse the collection at http://www.spaceweather.com/aurora/gallery.html. "Make More Miles on VHF" - 73 and thanks! As you might have seen, DK3XT, Bernd, will have to close down his great �Make More Miles on VHF� homepage in February 2006. Bernie writes: "After being online for ten years, I'll close meteorscatter.net and the mirror at qsl.net by Feb 28 th, 2006. Thank you all for your visits, and for the fun I had maintaining this site. I'll use part of this site's content to build a small website at dk3xt.net> (or dk3xt.de), which will be online later in 2006. The eMail-databases will be merged into DL8EBW's VHF DX/MS Databases ( http://www.dl8ebw.de/>. 73s, tnx and good Dx to you all : Bernie, dk3xt / ab7iy"
He agreed that DL8EBW will be able to follow his great "EXPEDITION anounce-service" from now on. For now he will use to give the infos out as a download XLS-SHEET from his homepage. Click on: http://www.dl8ebw.de/ACTUAL/actual.html and you will find some other info. Also try the button: "Make More Miles on VHF". If you have anything to spread around such as expeditions or rare square activities, please drop him a mail and will announce it at the above URL. The first trip of the year by ZS6JDE was totally rained out. The areas that Hannes, ZS6JDE, travels to are generally remote and roads are often just trails. Communications are difficult or even impossible when on the road and electricity is often not available at campsites. The vehicle is already loaded to capacity with passengers and luggage along with the tent and supplies required for the trip so space for the VHF equipment is very limited. Antennas have been limited to those that can be carried partially assembled as often they must be assembled in the dark after many hours of travelling over a rough road. Under the circumstances, it is remarkable that any EME contacts at all have been made and Hannes deserves a great deal of credit for the contacts that have been completed to date. Some preliminary dates have been received from Hannes for his next trip, and although they may not be exact they should be pretty close. From 25 June to 12 July he expects to be operating from Malawi as 7Q7JE. Although his C9 callsigns are not yet available, from around 14 July to 25 July he plans to operate from Namathanda, Mozambique and from around 28 July to 08 August from the Montepeuz & Nampula areas of Mozambique. Thanks to some very welcome assistance from Mike, K6MYC, we have four 2M9SSB antennas coming shortly that will be used for future EME operations in Southern Africa. Also on the way are two of the new 432EME-12 Yagis that will serve as the basis of a portable 432 MHz EME array that should be in use before the end of 2006. These antennas should arrive in plenty of time for the 7Q/C9 trip by Hannes but probably only a small stack of two antennas will be used this time due to transportation limitations. Another C9 expedition by Daniel, ZS6JR is also expected in early July and the other two antennas could very well be in use at that location just north of Maputo. We also have two other longer Yagi antennas that have been donated to the project and we plan to install these at the two semi-permanent locations in Malawi and Zambia as soon as adequate security is available at the sites. In addition to the trips presently planned by Hannes and Daniel, there are discussions in progress that could lead to other operations from African countries including 3DA0, 7P and A2 during 2006. Hopefully we will have good news regarding these operations soon. We have just received word that Bev Cavender, W4ZD, is now a Silent Key. No other information is available. Bev was well known for his EME and MS operations (long ago, he and I ran daily CW MS skeds for several years, finding some very interesting information). Bev also had one of the highest grid totals for a North American station, all done before the large influx of stations in new grids using WSJT. We also have received word that WA4MVI, Jimmie Doyle Stewart, 59, of Lyman SC, died Sunday, March 26, 2006. 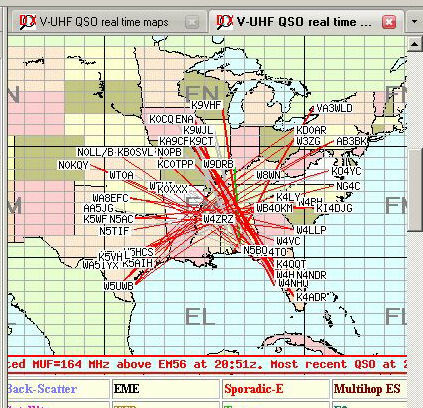 Jim was another well-known VHF DXer. We will miss these fine operators! It is reported (early July, 2005) that Fred Fish, W5FF, has recently passed away. No further information is available at this time. Fred, as K5TQP, put New Mexico on the air on 144 MHz, and was one of the best-known meteor scatter operators in the '50s and '60s. Later, as W5FF, he worked all continental US grids (and most of North America) on 50 MHz. Fred's passing leaves a big hole in our VHF operation. Deep Impact creates huge blast but raises more questions than answers. Early on 2005 July 4, NASA's Deep Impact mission smashed into comet 9P/Tempel 1, excavating a crater to probe the comet's internal structure. The blast produced was spectacular, larger than had been expected. Everything seems to have worked perfectly, and, as one researcher put it, there should be enough data generated to last until his retirement! Results are still coming in, but so far the scientists report seeing only weak emission from water vapor and a host of other gases that were expected to erupt from the impact site. This is a great surprise to many astronomers. "Theories about the volatile layers below the surface of short-period comets are going to have to be revised," Astronomer Charlie Qi said. Read more at http://spaceflightnow.com/deepimpact/050711swas.html. North America - it's severe weather season. Have you taken a recent Skywarn Class? Are your CPR and First Aid certifications up to date? Protect yourself - and your family! You can get severe weather (and other) alerts via E-mail, pager, etc, (free) at http://www.EmergencyEmail.ORG (as well as from The Weather Channel and several other places). Check them out (some are free, some are subscription services). Click on the link to see a short press release from the University of California at San Diego, announcing an award presented by the IEEE Information Theory Society to Professors Ralf Koetter and Alexander Vardy for "the top publication in information theory during the past two years." You may recall from reading the WSJT User's Guide that the JT65 decoder uses the Koetter-Vardy algorithm for soft decision Reed Solomon decoding. This is the subject of the award-winning research paper. In paragraph 5 of the press release you will see that the first practical tests of the K-V algorithm have been made by "Ham radio operators [who] used it to decode 'moonbounce' messages bounced off the Moon and back to Earth." Of course, the operators they are referring to are YOU, dear colleagues! You are using truly state-of-the-art, 21st-Century technology, and the academic world has noticed! This tsunami wasn't caused by an incoming asteroid. But still one of the largest natural disasters of the modern ages. Go to http://www.digitalglobe.com/ and click on "Tsunami Media Gallery" in the upper left. You can view or even download (with some restrictions) some "before" and "after" pictures. (See especially the first pair). (Also, under "QuickBird Images of Tsunami Sites" on the "Tsunami Media Gallery" page, click on "Download an analysis of Banda Aceh tsunami images", etc. Some very detailed images here). 2004 Sporadic E summary for North America. The first part of July had all of 2004's 144 MHz Es propagation, it seems. There were four Es openings in 3 days, followed by 2 or 3 more! The fourth opening was huge! The afternoon of July 6, a little after 2100 UTC, we had one of the biggest 144 and 222 MHz openings North America has ever experienced! (If you haven't read the summary in the October and November 2004 QST, you need to do so. And watch for another summary in the next issue of CQ-VHF). Operators in the New England states worked to the southeast for over two hours. They then began to work more distant stations and in other parts of the country. The 2-meter band was open from Maine to Minnesota, Texas to Florida, and possibly beyond (tho most locations could work in only one general direction). During part this time, 222 MHz was also open, and a number of 222 contacts were reported. There were a number of reports of DX beyond 1400 miles (2250 km) on two meters. The longest seems to have been between KY1K and K5QE, 1604 miles (2567 km). So far there is no evidence that this was double-hop. Was the range extended by tropo in the Northeast? Cloud-to-cloud hops? Or just extra-long single hop? (The most likely guess at this time). A few contacts were still being made as late as 0200 UTC. The opening ran for 4� hours, perhaps longer! It will be interesting to see the report on this after the VHF editors have time to go through all of the reports! Watch the upcoming radio magazines for more. Since mid July there have been no further reports of Es openings in North America, and Europe has had only a few more. The peak of the Es season is now past, but small openings are still possible. Continue to check the Es alerting service and whatever other methods you use. (You have signed up for the Es Alerting System (see below), and are also watching the 144 MHz Propagation Page, we hope). Remember to use Es in your 144 Prop msgs when you are reporting Es signals, in order to activate the DX Robot. Do not use Es (or es or E skip, or similar) when you are just making comments at other times, for these will trigger false alerts. (The North American Es log is available at http://www.gooddx.net/eskipNA.htm or http://www.xs4all.nl/~amunters/eskipNA.htm). Reports from North America indicated either a fairly poor Perseids or at least nothing special (see November QST, p. 91). Only a few reports were received from Europe, and they seemed to indicate about an "average" shower, but considerably better than North America experienced. Preliminary analysis of data by the International Meteor Organization yields some very interesting data. Experts in orbital dynamics have made some extremely accurate predictions for recent Leonids showers, with forecasts of brief outbursts at or near "storm" level in the showers of 1999 and 2001 proving to be very accurate. In 2004, this forecasting proved to also be accurate for the old favorite Perseids. Esko Lyytinen of Finland and Tom Van Flandern of Washington, DC, predicted that the earth would pass through a filament of debris cast off when comet Swift-Tuttle passed the sun in 1862, and this would cause a very brief but strong Perseids peak, but earlier than the expected peak time. They also said that the normal Perseids peak would be stronger than usual. As predicted, the early, sharp peak arrived at 2056 UTC on August 11, only 2 minutes later than predicted. Also, the normal peak on August 12, around 1200 UTC, was stronger than usual, as they had said. (See December Sky and Telescope, p. 100, for more). So why were the reports average to poor this year? The reason isn't known. But, since the early, sharp peak occured in the mid to late afternoon for North America, it is likely that few were on at that time in this part of the world. However, the "normal" peak occurred during the early to mid-morning hours in North America, when there should have been a lot of activity. But perhaps there was not that much "shower-type" activity this year. High-speed meteor-scatter techniques now allow contacts just about every day of the year, and it appears that there wasn't as much North American activity during the Perseids in 2004. Or perhaps these ideas are wrong. What are your ideas? Several people have requested some FSK441 pings (now FSK441A)to see what they look and sound like. Several are now on the HSMS home page in the FSK441 section. What will be the phase of the moon during the next meteor shower? Will moonlight interfere with visual observations? What time of day can I expect the moon to rise? Can I get on EME this evening? Figure it in your head! Calculating the Moon Phase In Your Head for the years 2000 through 2009.
step 1: Total (add together) the four digits in the year. step 2: Multiply by 11.
step 3: Subtract the largest possible multiple of 30 (e.g. 0, 30, 60, 90, or 120). step 4: Add the number for the month. step 5: If the month is January or February, add 1.
step 6: Subtract the largest possible multiple of 30.
step 7: Add the number for the day of the month. step 8: Subtract the largest possible multiple of 30. You now have the age of the moon in days for midday (UT) of your chosen date, thus your result may be interpreted as follows. This algorithm is accurate within 2 days for any date 2000-2009. This, and some other very interesting things can be found at http://www.moonstick.com/ and http://www.moonstick.com/in_head_2000-2009.htm. Jupiter DX. From NASA Science News - Giant Jupiter is a source of strange-sounding radio noises. Now anyone can listen to them, live, using a NASA-sponsored audio stream on the Internet. To listen, go to http://science.nasa.gov/headlines/y2004/20feb_radiostorms.htm?list920577. Click on one of the links in the paragraph just above the antenna photo. Also click on the "Samples" for some interesting sounds from Jupiter, and also for earth's own "dawn chorus." O. G. "Mike" Villard Jr, W6QYT, SK. W6QYT, well-known for his pioneering meteor scatter research (among other things) at Stanford University died January 7 at age 87. His meteor radar experiments in the 1940s laid the groundwork for what we routinely do now, and his name appears in the bibliography of any work on the beginning of meteor scatter. See April QST pp. 87-89. We have lost another of the VHF pioneers. From Bob's oldest daughter, via WB6FFC: Early Sunday morning Robert Sutherland, well known Moon Bouncer, 48 year employee of Eimac as Director of Advanced Products lab, Editor of "The moon bounce notes", author of numerous Practical QRO VHF amplifier articles, member of the team that preformed the FIRST Amateur Radio Moon Bounce, passed away. He passed away some time between 8 and 9 AM Sunday Jan 11. The reason for death is not known at this time. His body has been interned with the Neptune Society and his wish was to have his ashes scattered on the Sacramento River. An obituary that will be fully inclusive of his history and contribution to the fraternity of Amateur Radio and more specifically the VHF & UHF community is being prepared. Watch the various publications, etc. Those who were on EME prior to the personal computer (and even prior to the programmable scientific calculator) will remember the many Eimac helps, covering many antenna mounts, how to figure (more or less) where the moon was and when it would set for the Europeans (the "European Window"), and, of course, the 8877 amp. All of the above are here beside me! Thanks, Bob. You will be missed! 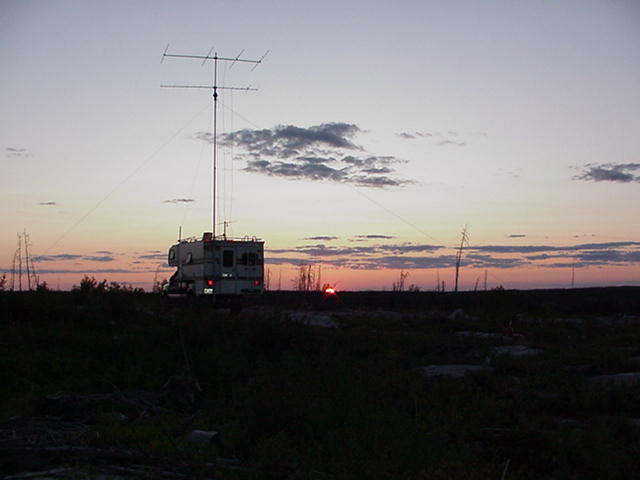 Larry, VA3LK, asks for any active VHF amateur living north of 60� in Europe or Asia to contact him by email at . He would like to discuss an experiment he has in mind with possible candidate stations. Multi-hop Es across the Atlantic! FM broadcast stations from the Northeast were heard in Europe on June 26! See the map at http://www.dk5ya.de/es_summary_03_june_26.htm (audio clips also available there). Also see the page dedicated to this at http://www.dxradio.co.uk/transatlanticfm.html. From the DK5YA VHF Web page - "MUF was very high the whole day through in Europe. But in the evening a huge multi-hop opening started across the Atlantic Ocean, lots of VE's and W's into Europe on 50 MHz with booming signals. And MUF was rising and rising - up to 100 MHz from Maine/USA and Newfoundland/Canada to GI and GM - perhaps it was on 144 too? Who knows cause it's hard to find one being active on 2 meters in VO1." Also from the DK5YA page, Charles, EI5FK, comments, "This will probably interest many people here. I worked with a radio officer in the Irish Navy who after changing jobs told me that he clearly heard US or VO Coastguard (I forget which) on 156 mhz from less than 200 miles outside the Irish coast one summer about 15 years ago, taking into consideration both sides were using vertical aerials of low gain and that the VO/US Coastguard was probably using less than 25 watts, I believe that the main problem is a lack of hams willing to put in the effort on 144 mhz." All WSJT FSK441 MS and JT44 EME ops - please register your station at http://www.aa1yn.com/wsjt. Then, after K0PW updates the callsign.txt file, download a more complete version at http://hill195.home.mchsi.com/callsign.txt. (It is well worth your time both to register and to download the updated file). Since you probably have calls and information on your copy of the CALLSIGN.TXT file that are not on K0PW's or K2TXB's, you can now merge them with a new program from K2TXB. The latest version of the WsjtMerge program is now available at: ftp://russk2:[email protected]/wsjt/WsjtMerge101.zip or ftp://[email protected]/wsjt/WsjtMerge101.zip (some browsers seem to need one of the addresses, some require the other). Russ also has an expanded copy of the callsign.txt file on the ftp site: ftp://[email protected]/wsjt/Callsign.txt. There is a new Manual available describing Random Hours for MS operation. It can be found on the WSJTGROUP Page at http://www.qsl.net/wa5ufh/WSJTGROUP/WSJTGROUP.htm and can be printed for easy reference. The crew of the International Space Station enjoyed a unique view of the 2001 Leonid meteor storm. You may also wish to check out the older Web sites of David Asher and Robert McNaught, who are revolutionizing meteor shower predictions with their dust-trail model of the Leonids shower. Six-meter EME rope Yagi. With the ever-increasing interest in JT44 mode of weak signal communications, and the availability of HF amplifiers that now include 6M, there are a number of stations with 6M EME capability. And, often the only thing keeping DXpeditions from operating 6M EME is the lack of a decent antenna. Inspired by the success of AA7A with his 6m rope Yagi, W7GJ contacted VE7BQH about designing a version of a rope yagi for 6m EME, to go along with his 2M rope yagi for EME that has been on his website for several years. Here is a link to the 6m sloping rope Yagi (on WA1JXN's Web page), most graciously produced by VE7BQH: http://www.bigskyspaces.com/w7gj/6mRopeYagi.htm. First contact has just been made with it. More information on AA7A's Web site at http://members.cox.net/aa7a/6M_EME/aa7a_6_meter_eme_project_page.htm. PA0JMV has put an audio file on his home page of the huge sigs that were received from W0EKZ, using that type of antenna. Go to http://www.planet.nl/~pa0jmv/radioRESULTS/radioresults.htm, then scroll down a bit. WSJT's JT44 EME mode is being used more and more for EME, with operation nearly every day, regardless of the distance to the moon (usually expressed as it's Semi-Diameter, SD). Even during apogee, 4-Yagi stations are often working 2-Yagi (or smaller!) stations. W5UN recently completed with ZS6WB (50 watts, 5 el) under less-than-optimum conditions. If you are active on VHF and haven't tried JT44 EME, monitor some of the schedules listed on the JT44 Web page. (WSJT tells you where the moon is located, and a station without elevation usually has several signal peaks when the moon is between 0� and 12� elevation). The new Skd87 EME scheduling program (available on AF9Y's Web site) now includes a section for JT44 stations. If you're active on JT44 EME, you need to register your station with , including your Call, Name, Grid, Power, Antenna (and whether or not you have elevation), the fact that you're on JT44 EME, your E-mail address, and whether or not you are actively using the Skd87 list or if you would need to be contacted via E-mail for a sked. We have received word of the death of Marc, F9FT, March 2. Marc was a pioneer for EME and manufacturer of the famous Tonna 9 element Yagi in the earlier sixties and then the 16 element. He was a passionate person for antennas and his Ham hobby till the end of his life. The recent edition of the Australian Digital DX News reports on a DXpedition by Rex, VK7MO, to the rare grid square QE46 at Cape Hauy on the East Coast of Tasmania. The DXpedition involved backpacking the station over some 4 km of very rough terrain. To quote Richard Rogers, VK7RO, "The whole thing is so ridiculous it has got to be worth doing". In addition to the radio equipment and laptop computer, a Honda generator, tent, sleeping bags, etc., also had to be carried in - and then were nearly blown and washed away during a big storm that night. (It makes interesting reading!) In spite of the difficulties, a number of FM, SSB, FSK441 and JT44 contacts were completed with approximately 50 stations. The Winter issue of CQ-VHF should still be available. It contains several articles that should be interesting to the readers of this page. In particular is a paper by VK7MO on FSK441 MS operation in Australia. In this paper, Rex looks at some of the data by D.W.R McKinley in his classic Meteor Science and Engineering, then compares this with experiments run "down under." This is well worth your reading. However, please note the following - both of the formulae in the article have several errors that make them unusable. The editor is aware of this, and a correction will be presented in the Spring issue. Also, some of the experiments run down there differ somewhat from the way we typically operate in North America and Europe. Thus, while his conclusions are valid, there are a few differences for us. Along with corrections of the errors, the Spring issue will have a review of Rex's paper, pointing out these differences. But don't wait for the Spring issue, for it will not contain another copy of the paper, but only corrections and comments on it, which would be useless without having the original. Bob Kocisko, K5PF, reports that his article, Getting Started on 2-Meter EME to Work Lots More DX, also contains several errors which could make things confusing to someone just getting started. All of this has made editor N6CL quite unhappy! Apparently the New York staff aren't that familiar with VHF operation! So, if there are things in the various articles that don't make sense, either contact the author or wait for corrections in the next issue. (Click on picture for enlargement). "I will not be going back to the Marine Chemist as she was sold for scrap last week. 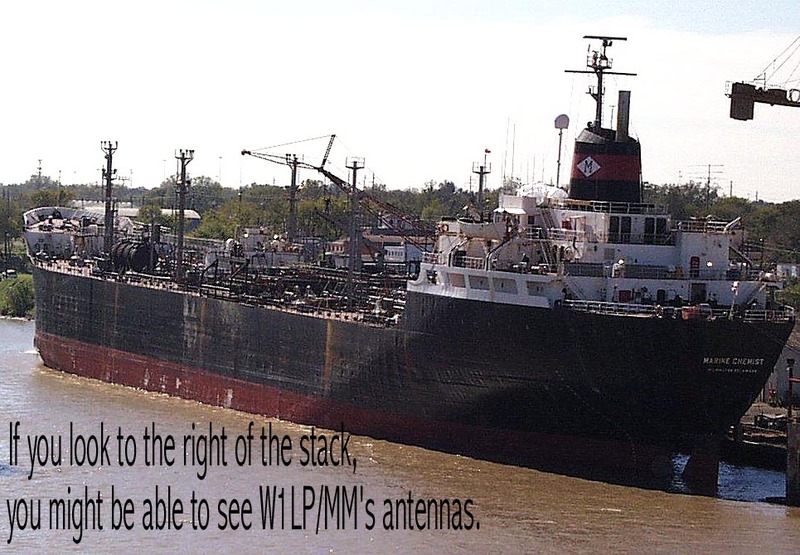 The ship could only carry oil until the end of 2003 in U.S. waters so I knew her days were numbered. The owners ended up getting rid of her early which was a somewhat of a surprise. She is in now laid up in Vancouver, WA. She will be reflagged next week, recrewed with Chinese, and sail for India where she will be driven up on the beach and cut up. "I also work when I am at home as a harbor pilot taking ships through the Cape Cod Canal and into Narragansett Bay. I have been planning for a few years to make the transition to doing this full time and this may be that time. Thanks, Clint, for the new grids on several bands, and the exceptional signal that you put out from the Marine Chemist. We're going to miss your CQs. Propagation/auroral alert pgm - Jim Tabor, KU5S, has a program that automatically checks current solar flux, sunspot, A index and K index numbers over the internet and displays them along with one-word summaries of solar and geomagnetic activity over the past 24 hours and the next 24 hours in a little window on your PC desktop. It is called Geo-Alert Wizard, and is available for free trial with a license that expires May 20. You can download it at http://www.taborsoft.com. Note - Jim does not know what its status will be after May 20. It has one annoying feature - after you have checked conditions once, it continues to try to check again every 30 seconds. If you use a dial-up connection, this is very annoying. Jim is trying to work out how to make it "check on connection," but has not figured out how to do this yet (any programmers help him with this?) The work-around is to put a shortcut on your desktop and run it from there. After checking conditions, you must then remove it from your program tray to stop the annoying pop-ups. Other than this problem, it is a quick way to check for the possibility of an aurora. And, of course, don't forget N1BUG's aurora page, also found in the "Quick Links" at the top of this page. (Paul's page was one of those Web sites mentioned in the March 2003 Sky and Telescope). Transatlantic 144 MHz signals: Two-meter transatlantic signals have apparently been received on several occasions, but there have not yet been any contacts in spite of several attempts. A number (most??) of these attempts have been poorly planned and executed. A few were better attempts. But the Brandon Trophy still waits for the first confirmed contact. At this time it is known that there is one ongoing test, and two others are in the works. (Each of these tests is a very different attempt in the path, means of propagation, etc). There occasionally are other tests, unnannounced because the chance of success is small. But as more serious, knowledgable Amateurs take up the challenge, the chances of the first transatlantic contact improve. We are thinking about another page, giving details on any upcoming tests or requests for stations to assist, and results. Or, if a group desires to keep their attempt quiet, only what they request would be announced. Would a Transatlantic Hot News page be of any value? Certainly not without some carefully planned transatlantic attempts. If you are involved or are going to be involved in a serious transatlantic test and would like some brief information publicized here, let us know. W5LTU's excellent moondata chart for 2003, with explanations, is available at http://www.qsl.net/ea6vq/w5luu.html. K9UIF, SK - Long-time VHF DX operator Walt Cummings has passed away, it was reported in the January 2003 QST. We miss Walt. Mark, Walt's son, writes that he now has his call and is trying to keep the big signal alive. Grote Reber, 1911-2002, SK. Grote Reber, credited with the first survey of the radio sky, died on December 23rd in Tasmania, Australia, his home for some 50 years, at the age of 90. In 1937, five years after learning about Karl Jansky's discovery of natural radio emission from cosmic sources, Reber used his own money to build a 31-foot-wide dish in his Illinois backyard. His first all-sky radio map followed in 1941, effectively launching the discipline of radio astronomy. Mr. Jansky's results received little attention from other scientists at the time, but Mr. Reber, who was also a ham radio operator, set out to determine whether the waves were coming only from the galaxy or from other celestial objects. In 1937, using about a half-year's worth of salary he had saved from jobs at various radio manufacturers, Mr. Reber erected his telescope. In 1944, he created the first contour radio map of the sky, with brighter areas indicating richer radio sources, the brightest being the center of the Milky Way. Mr. Reber's original radio telescope is on display at the National Radio Astronomy Observatory's site in Green Bank, W. Va., alongside a full-scale replica of Mr. Jansky's antenna. Perseids reports for 2002 continue to trickle in. Initial impressions have not changed. In general, totals seemed lower this year than in previous Perseids, and many Europeans felt that the shower was "poor." First Sky and Telescope visual reports indicate an "average" shower, as does the initial IMO release. Europe - Many operators did well. The largest number of contacts reported so far was about 50 (by several Europeans), generally on FSK44,1 random. All European reports have been for 144 MHz only, and many report picking up a number of new grids. Several Europeans report doing well with 40-50 watts, and one station reports a number of contacts with both stations running less than 5 watts (using FSK441). S55AW worked RA4AOR on HSCW over a distance of ~1440 miles (2319 km). North American reports are still meager. A number of stations were known to be active on 50 MHz, but we have no further information. It appears that most 50 MHz activity was on FSK441, with SSB activity very low. (On 50 MHz, SSB should be better during shower periods). K9KNW and W7XU completed a 1486-mile contact, which is the longest distance reported and is believed to be a new record for the FSK441 mode. There was a "near miss" of interest - K2TXB and WØAH came close to a MS contact at a distance of 1617 miles (~2603 km), but were unable to exchange final R's. Most of this exchange took place during a 90-second burst! W0AH's signal peaked at 4 db above noise, and was very unstable in strength - weak and fluttery. (They saved the pings they received for proof). K2TXB also ran with W5UWB, a distance of 1558 miles (2508 km). A few minutes into the sked he copied both calls in about a 3 second burn. Nothing more was heard. Several 222 contacts - at least 20 - have been reported. (Most 222 stations were in the 150-watt range). No 432 MHz contacts have been noted, but there were two "near misses" reported. It is believed that other schedules were attempted on 432, but we have no further information. FSK441 was the mode of choice for nearly all contacts on all bands. A little SSB activity was reported from both Europe and North America, but its use was very limited compared with previous years. Europeans are reporting only limited HSCW activity, with FSK441 being used by nearly everyone. W2EV and BEACONet report the first PSK-31 reception via MS, when a single 6-meter PSK31-based transmission from W2EV was received and fully decoded by WD4RBX. A 6-meter MS-based AX.25 reception at exactly the same time also occurred, apparently propagated by the same burst. Use of the FSK441 calling frequencies, but listening and moving to another frequency for a contact, was found to be necessary in both Europe and North America because of the amount of activity. While this was generally successful, a few stations new to meteor scatter did not seem to understand MS procedures. (North Americans - be sure you have a copy of the MS Procedures). Several Europeans report that their calling frequency (144.370) was "crowded" to "chaos" for a number of reasons. It was also noted on both sides of the Atlantic that some stations would answer a CQ, but would call for only a few minutes before quitting and leaving the frequency. Remember that pings may be separated by a number of minutes, especially if it is not during the peak of a major shower or if the geometry is not optimum. What is the latest on the claimed transatlantic terrestrial (MS) contact? No further information has been received, and E-mail requests for details have not been answered. All that has been learned so far is that the operators did contact a well-known VHF operator for advice and help, and apparently had adequate equipment. They are completely unknown to the VHF community in the northeast US and Canada, however. In their initial communiqu�, they promised that a lot of pictures, etc, would be put on a Web site as soon as they returned. Nothing more has been heard since then. As the old saying goes, extraordinary claims require extraordinary proof. So far nothing at all has been released. WZ8D/VE2 and WZ8D/M. Click on pictures for enlargements. We don't have a report yet on WZ8D's DXpedition. However, he put at least a dozen grids on the air (most of them while mobile) and gave out a number of FSK441 MS contacts on 144 MHz. We hope to have a summary here soon. John has a bi-directional Yagi he plans to try when going to Florida in late December, for he is sure it will work much better on WSJT mobile than the 10 element Yagi. He also plans to take WSJT to the Bahamas with him in November. It's usually stated that the meteors we use in our communications are the dust thrown off by comets. Actually, planetary scientists still debate how much of the dust in the inner solar system arises from comets and how much comes from asteroids. (SHOWERS are of cometary orgin - except for the Geminids, believed to be from Apollo asteroid 3200 Phaethon). And we know that approximately 75 km/sec (160,000 mi/hr) is the fastest that any of the meteors can be, for if they were any faster they would have enough velocity to leave the solar system. Surprise, surprise. The Advanced Meteor Orbit Radar (AMOR) in New Zealand determines the orbits of about 1000 meteors daily. Several of these are of INTERSTELLAR origin. W. Jack Baggaley has discovered that Beta Pictoris, a nearby star with a dusty disk, is a strong source of the interstellar meteoroids! Does this qualify for interstellar MS communications? (Probably not, for they're so tiny that they aren't likely to be useful for communications). For more, see http://www.canterbury.ac.nz/publish/research/96/A08.htm and the January 2001 Sky and Telescope. From NASA Science News for February 21, 2001 - NASA scientists are using an experimental radar to monitor a swarm of space dust surrounding our planet -- cosmic junk that can pose an electrical hazard to satellites. Now anyone can listen to the radar echoes, live on the Internet. See http://science.nasa.gov/headlines/y2001/ast21feb_1.htm?list133415. [Note - They're simply using a TV channel 4 video carrier in forward-scatter mode - the same thing a lot of us have been doing for a long time, except for putting it on the internet, and wanting to set up a world-wide network. But still interesting]. We're familiar with VHF/UHF, but what's at the other end of the spectrum? That is, even lower than the LOWfers go - where the frequency ranges of radio and audio overlap. If humans had radio antennas instead of ears, we would hear a remarkable symphony of strange noises coming from our own planet. An online receiver at the Marshall Space Flight Center is playing these songs of Earth so anyone can listen. For more, go to http://science.nasa.gov/headlines/y2001/ast19jan_1.htm?list133415. (This site has been hard to get to, but has some interesting listening if you can properly access it). Along the same line, listen to sounds from Jupiter, as recorded by the Casini spacecraft at http://www.jpl.nasa.gov/cassini/acoustic. Electrophonic sounds from meteors - The New Scientist magazine has a fascinating article concerning these long-disputed sounds. If you haven't already read it (it was on several reflectors), go to Sizzling Skies for some of the latest. And for more, see also electrophonic sounds data and follow those links. HELP WANTED WITH ELECTROPHONIC SOUNDS FROM METEORS. Very bright meteors have occasionally produced sounds at the same time as their sighting. Because of the distances involved, this obviously rules out ordinary sonic booms (also sometimes heard). These "electrophonic" sounds have been known for several hundred years, but are not understood. The International Meteor Org. is requesting reports of electrophonic sounds. For more information, go to the Global Electrophonic Fireball Survey. Even if you aren't really interested, it would be well for you to read this. Perhaps some day you might be lucky enough to hear this sound! 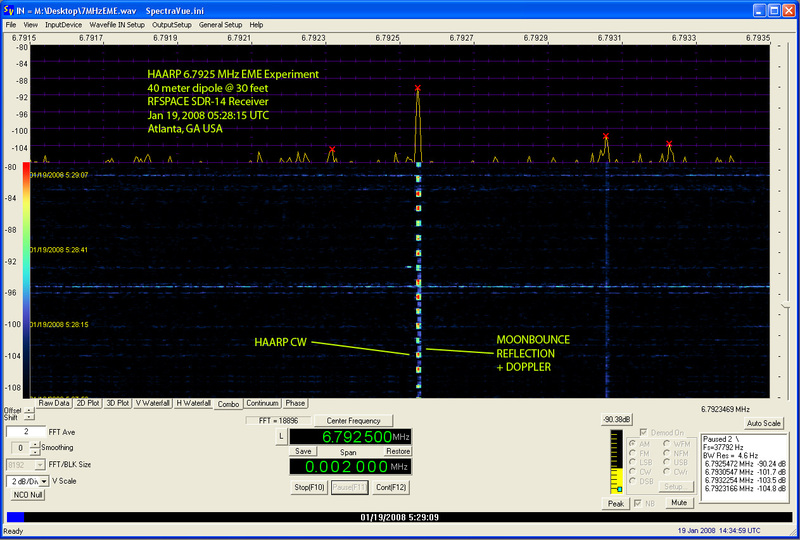 Have you considered ionospheric scatter on 144 MHz? If not, re-read the report in the Feb. 2000 QST, p. 84. At the 2000 Central States VHF Society conference K5JL reported the following: "Don WA1JOF and I started the whole process and we have run a number of times. Never have we failed to detect a signal at a distance of 1579 miles. Signals seem to be like one is in a dream world - they just all of a sudden float up out of the noise. They can remain for a full minute sequence or for only a few seconds. I have yet to hear a meteor on this path, though Don has heard a few meteors on my signal. "It was one day in November that Don and I were running with good results - then all of the sudden - Darrell VE1ALQ actually broke in and we exchanged reports (1768 miles). Darrell was using a small Yagi and much less power than 1 kW. "Signals seem to be best around 1500Z to 1600Z.....It would appear from the distances envolved (sic) that the scattering is taking place somewhere in the upper part of the E layer." "Really good and long lasting IONO today. I discovered it late. G7RAU sent an E-mail and luckily I looked in the mailbox before the evening....Starting 1230UTC I worked 29 different stations G,PA,ON,F,DL,HB and 9A in the biggest pile-up I ever experienced via IONO. (If callers added a random offset within +/- 500Hz or so I would work many more stations.)" Does this bring up a number of questions? Possibilities? Look at some of those distances routinely worked. Re-read the QST article and let's run some more skeds over here! For other Web-based services, try the following: http://www.spacew.com/aurora/aurora-order.html or http://www.spacew.com/aurora/ for the STD Aurora Monitor, which a number of people have found to be a very good program. SpaceWeather.com has announced a new feature: the weekly Meteor Outlook by Robert Lunsford, secretary general of the International Meteor Organization. Updated every Friday, the Outlook offers a comprehensive preview of likely meteor activity suitable for novices and experts. (Space Weather also has up-to-date information on sunspot activity, geomagnetic activity, etc. Very ineresting Web site! Bookmark it!). For more information visit http://www.spaceweather.com, go to Meteor Outlook, "more information". (Web site also has good solar, sunspot, geomagnetic, etc. summaries on first page. Also another aurora alerting service. Worth checking out). Do you have the latest version of this page? Probably, but you may not! Click your "Reload" button to be sure! Many ISP's are now putting Web caches on line! These supposedly speed up Web searching by storing previously-viewed pages to more quickly return to them. This is fine for the average page, which is seldom updated. But for pages like this, which may be updated every week or even every day, it's a disaster! And it's MUCH worse for pages that update every few minutes, such as N1BUG's real-time Aurora page or the various Propagation real-time Web pages! My local ISP has one now, and I've been fighting it for over a month. To no avail! It's here to stay, they say! And one is probably coming to your ISP soon, too! (I am told that some people have complained enough to get them taken off of their ISP's. This has not worked here). There are special meta tags in the header of this page, so that if you have one of those Web caches, it should update properly when you force a reload. But there is no guarantee of this! And there isn't a thing more that I can do about it. So, if you have this problem, all you can do is to complain to your ISP's Supervisor. The one here has severely damaged my access to the Web. I have done all I could do, and it is not enough. I hope you don't get burdened with this, but it seems to be the coming thing! By the way - even if one is installed, don't expect your ISP's technicians to even know what your're talking about! And remember this for the future, when one comes to your neighborhood! K1JT - (From January 2000) - Another "new" operator has joined the ranks of HSCW - K1JT, FN20, has been very successful in his first month on HSCW MS. His equipment is not exceptional - a 160-watt amp into an 11-element Yagi. This is considerably smaller than the 300-meter dish at Arecibo! Joe is Dr. Joseph Taylor, 1993 Nobel laureate for Physics. In 1974, Joe, then K2ITP, and his graduate student Russ Hulse, then WB2LAV, went to Arecibo to search for pulsars (first discovered in 1967 by graduate student Jocelyn Bell). Using a computer to sift through the data, they discovered the 59-ms pulsar PSR B1913+16. This proved to be a binary system in a highly eccentric 7.75 hour orbit. Over the next several years the orbital decay was measured by Joe and his collaborators as the pulsar's period slowed by a few millionths of a second each year, almost precisely what general relativity predicts should happen, and adding confirmation to the existence of gravity waves. For the discovery of this first binary pulsar, Joe and Russ were awarded the 1993 Nobel Prize in Physics. But Joe's adventures go back far beyond his astronomical work. He and his brother Hal, K2PT (then K2ITQ), were active on VHF since the mid-1950's. At age 17, QST published Joe's study on ionospheric scatter on 6 meters, and he and his brother were known for their VHF contest scores. Now Joe has joined the North American HSCW group. For more background, see the December 1993 QST, pages 9 and 91 or http://www.nobel.se/laureates/physics-1993.html. June 2001 - K1JT is the author of WSJT, the new fully-digital MS program, now undergoing testing. VHF-UHF pioneer Paul Wilson, W4HHK, of Collierville, Tennessee, died 1999 November 29. He was 75. A stalwart in the 144-MHz and Microwave Standings, Wilson remained active right up until his health deteriorated earlier this year. In early July, he completed his VUCC on 10 GHz. He celebrated his 75th birthday in September by making his first contact on 24 GHz. Wilson got his ham ticket in 1941 at the age of 16. While still in high school, he began experimenting on the old 2-1/2 meter band (112 MHz). After World War II, he rekindled his interest in VHF and UHF, becoming a major figure on the then-new 2-meter band. During the 1950s, he got involved in meteor scatter propagation. In 1954, W4HHK and Tommy Thomas, W2UK in New Jersey sent and received reports via 2-meter meteor scatter over a 950-mile 1520 km) path--a first! W4HHK and W2UK won the ARRL Technical Merit Award for 1955. Wilson took on the challenge of Earth-Moon-Earth propagation as well, and in 1961 he began work on an 18-foot dish. He was among those making their first 70-cm EME contacts in July 1965. From that frontier, he moved on to attempt 2304 MHz moonbounce, and he won the ARRL Technical Merit Award for 1969 for his work on that band. In 1970, W4HHK and W3GKP claimed a new record--the first 2304-MHz EME contact. In 1972, Wilson used his 18-foot dish to monitor the Apollo X command module on 2.2 GHz as the astronauts orbited the moon. He received a NASA confirmation of his reports in the form of a photograph signed by all the astronauts on the mission. Wilson retired in 1980 after 30 years as an engineer for TV station WMC in Memphis. His wife ''DB''--to whom he was married for 54 years--is W4UDQ. His son, Steven, is N4HHK. A service was held December 2 in Collierville. (info from ARRL, NTMS Web site, others). Did you realize that on 14 August 1959 W1REZ in Fairfield, CT had a "partial" MS- to possibly ES-enhanced QSO to AJ2GA, which was a US Military MARS station in Torrezon, Spain, on a plateau overlooking the Atlantic Ocean? Since AJ2GA was not an amateur station and operating out of the 2M band, there was no written reports in QST. These Archives are updated whenever information is removed from the Hot News page, but it is felt that the information may still be needed for awhile. The information you're hunting isn't here, either? Then try the Really Old News Page.